Steven Kitchens describes the new, nonmobile location of 3Ninjas as "a tiny home with food," and he's not exaggerating. At 315 square feet, however, the restaurant is still larger than 3Ninjas' food truck and mobile catering kitchen inside an 8-foot by 20-foot trailer. Perhaps most importantly, the new space has heat, running water and a dishwasher. "The little things make us happy after living on a food truck for five years," Kitchens says. 3Ninjas, which debuted in the midst of Spokane's food truck boom about five years ago, opened the new storefront at the beginning of December in a space that formerly housed Solace, a cider and mead tasting room. Fans of 3Ninjas' bright green food truck, which specializes in fish tacos, rice and noodle bowls, will find a different menu, but familiar flavors, ingredients and service. 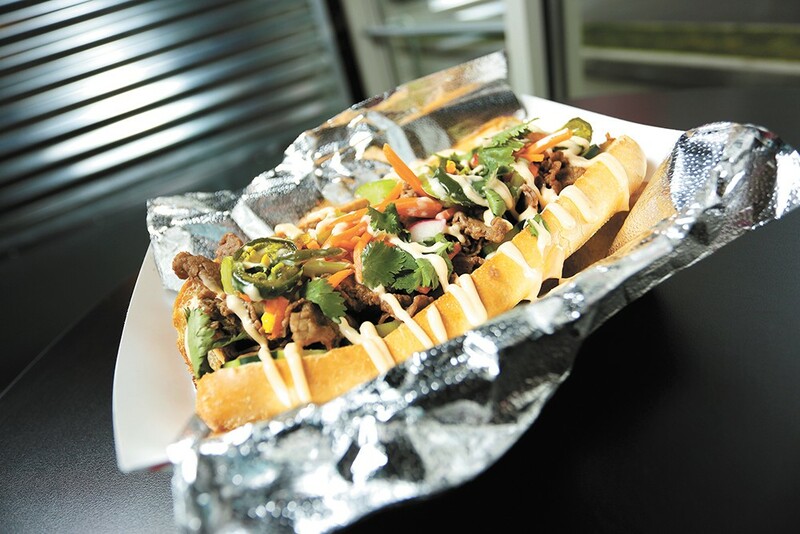 "The food truck is going to keep its traditional Asian fusion format, and this is more like if you want contemporary fusion," Kitchens explains. The Kendall Yards menu features a trio of options for tacos (three for $10), wraps ($10), sandwiches ($10-$13) and salads ($11-$12). House favorites are the "fire" wrap, with chicken, habanero jelly, cabbage, cheese, onion, jalapeno mix and habanero aioli. The Thai lemongrass tacos, with tofu or chicken, are another standout, along with 3Ninjas' take on the classic Thai banh mi sandwich, served with steak and pickled veggies. Any item on the menu can be ordered with vegetarian or gluten-free ingredients. Sides are chips and salsa ($5), a salad ($5) and hummus with veggies ($7). Kids have their own $5 menu of mini corn dogs, grilled cheese and a quesadilla. At the new spot, 3Ninjas also sells its three housemade hot sauces ($5/each), which aren't used in dishes at the restaurant, though often feature in its catering: mango habanero, smoke jalapeno and "Sweet Melissa," a Jamaican style pepper sauce. 3Ninjas is owned by Kitchens and two other business partners and longtime friends, Tymen Hofmann and Michael Anderson. The three met while working in various other food service positions and decided to team up to open a food truck and catering company back in 2014. They've since been hired to cater weddings, office parties, music festivals at the Gorge Amphitheatre and even a wild divorce party. The trio was approached by Kendall Yards developer Greenstone this past spring with a proposal to move into the then recently vacated space on Adams Alley, just around the corner from Summit Parkway. Greenstone's staff had gotten to know 3Ninjas as regular vendors during summer's Kendall Yards Night Market. Kitchens says they immediately agreed, but first wanted to focus on getting through their busiest season before getting deep into renovation and rollout. "Kendall Yards is a hotspot in Spokane and the foot traffic is huge. Even being off the beaten path we know we're going to do well," Kitchens says. "We have a great following, and the community has received us so well." The trio of "ninjas" plan to operate their food truck and mobile catering as before while getting established in the new spot this winter. Currently they're the only three employees, but that number will grow when it warms up next spring. Nice weather will also bring plenty of outdoor seating, as currently the tiny space has just two bar-height tables for eat-in customers. Kitchens foresees that each venue will help grow the other. The original print version of this article was headlined "Three's Company"
Fri., April 26, 5:30-9 p.m.